I've finished shooting my television series Michael Winner's Dining Stars. Loved the film crew. Well, half of them were okay. Actually, there were two I didn't mind. We filmed in Bruges. As a Bentley whisked me and my assistant Dinah away, I saw the director, Nic (pompous - doesn't use the "k" of Nick), outside Ostend airport, looking worried. There was no vehicle to pick up the film crew. The production manager in London had called a local taxi firm. Not surprisingly, it hadn't turned up. I could give lessons on how it should have been done. Nic called the number recommended on the call sheet (the day's working paper); still nothing appeared. Eventually a car was sent from Bruges, more than half an hour away, to bring them back. Incompetence like that drives me bananas. It was a showery one-day shoot. The call sheet listed seven people with production credits. Yet they couldn't pick up a film crew at the airport. 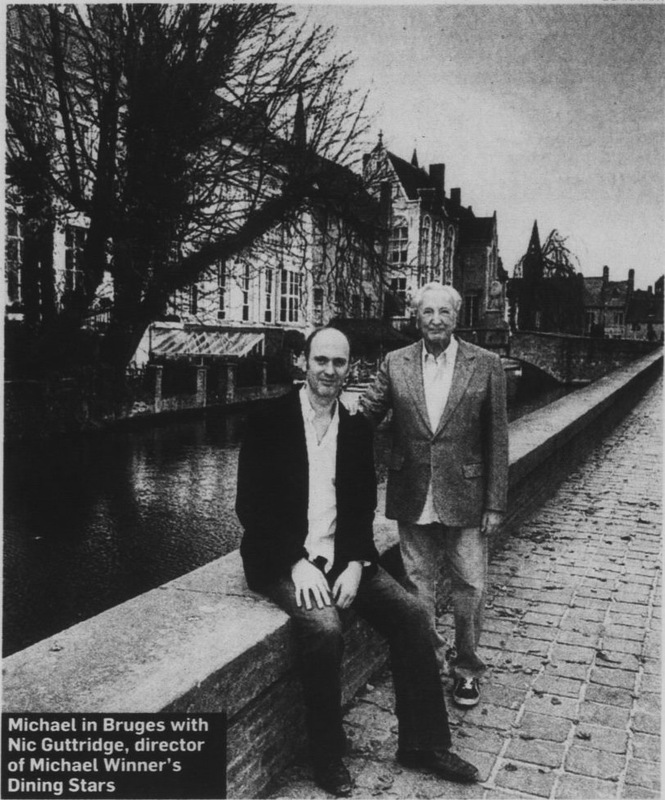 When Nic finally arrived in Bruges, some two hours late, he said, "I could have done without that lost time." Maybe we missed a great shot with the sun glistening through trees, rippling on the water, whatever. So I was not in the best of moods when I entered the hotel De Tuilerieen. Which sank further when I saw my gloomy room overlooking the car park. The place wasn't full. Why not a room overlooking the canal? There's a ghastly saying Hollywood film crews use about artistes, "Bring on da puppets." I was not infrequently treated like a puppet. "Do you good," I hear you say. The hotel duty manager, Peter Perquy, took ages to explain why the 10 buttons on the phone weren't labelled. How to call room service? Front desk? Men on Mars? Whenever Dinah went to the desk to summon him, either no one was there or he ignored her. Peter finally said none of the buttons was programmed for anything. "I told you to ring 111 for the front desk when I showed you in," he said testily. He didn't. I made my views known. Peter flounced out in a huff. We went to board our boat on the canal. A worried man arrived. "Mr Winner, I'm from the hotel," he said. "I want to apologise for the way you were treated. Is there anything we can do?" "Who are you?" I asked. Someone so scruffy I presumed must be the owner. "I'm the accountant," he replied. "Good. I'll have money," I responded. It being a Monday evening in Bruges, most places were closed. In desperation Dinah and I went to the restaurant Den Dyver, next to the hotel. It was fantastic. One of the best meals ever. The owner and host, Philip Vandenbusche, looked like a violinist in a provincial orchestra. "The preparations we are serving are each time flavoured with beer. That is the speciality of the restaurant," he announced. I tasted no beer. The black bread was great. A salad with duck, fresh shrimps, black olives and cheese straw appeared (and was devoured) like lightning. Then came cod fish fillet, celeriac, laver (a kind of herb), mash of sweet potatoes and bacon. Superb. I finished with fig tart, cured cheese, almonds and honey ice cream. Everything, including freebies, was good as it gets. I recommend Bruges, but (a) be sure you can get out of Ostend airport, (b) go to Den Dyver and (c) take the train. Actually, I did like all the film crew. Efficient in production matters? Er . . . my lips are (almost) sealed. When I think of the hours I spent on the phone with Stanley Kubrick discussing the minutiae of location filming, of the more than 40 location movies I organised, I'm left dazed at what went on. But dazed fades. I've dealt with the bosses of all the major Hollywood studios for decades. One of them phoned me as I was writing this. Without doubt, Peter Fincham, ITV programme chief, and Alison Sharman, in charge of factual and daytime, equal the best of Hollywood executives. They have ability, dedication, charm, professionalism. Peter reminds me of my late friend Lew Grade, founder of what became ITV. They have different backgrounds, very diverse personalities, but the same enthusiasm and skill for entertaining the viewer. To keep up the bonhomie ("Must have missed that," I hear you say) I'll recount how, recently, the production staff were seeking a Rolls-Royce to replace my Phantom V, which is acquiring new upholstery. Nic told me they'd come up with cars minor by comparison. I emailed Matt Walton, the oh-so-charming executive producer, "It's amazing your people didn't suggest a 20-year-old Ford Corsair. That would have been down to normal standard." Matt emailed back, "Hello, sir, I'm delighted to read you're in your usual high spirits." I laughed out loud. Anyone who can do that with an email deserves a prime place on the planet. PS: In our photo you'll notice Nic is lacking hair. Before he started with me he had a full head. Since the picture was taken Nic's gone totally bald. Just another of my achievements. PPS: For those who don't believe I exist (that includes me), go to Fortnum & Mason in Piccadilly tomorrow. At 4pm I'm signing my literary works. See you? I was deeply moved to receive your Christmas card - until I read I was merely one of 2,500. I was shocked to see on your Christmas card photo you were being seen off the premises by two South African mercenaries. Lucky you weren't thrown into the pool as your gold Patek Philippe watch would have dragged you to the bottom. Placing your vulgar Christmas card in full view has caused me to lose my grander friends at a rate of knots. This is a vast saving to me at such an expensive time of year. I love it when a plan works. Thank you. What an honour it would be for a struggling student's mantelpiece to be adorned with such a Christmas card. It will make my meals of fish fingers and alphabet spaghetti that bit more tolerable. Have you seen Jon Culshaw's impression of you on his TV show? It's not very good. He's far too well dressed. Ditch your Chubb security system. Just post your weekly photograph captioned "I live here" near the front door. I guarantee the local rogues will go elsewhere. This works well for friends who have a picture of their rottweilers similarly displayed.